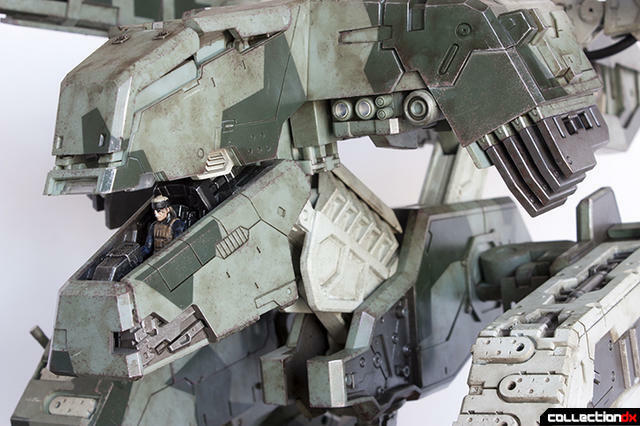 Fans of Metal Gear Solid (including myself) have been waiting for a Metal Gear REX figure since the release of Metal Gear Solid on the PlayStation in 1998. Well, in November of 2009 our prayers were answered, or so we thought. 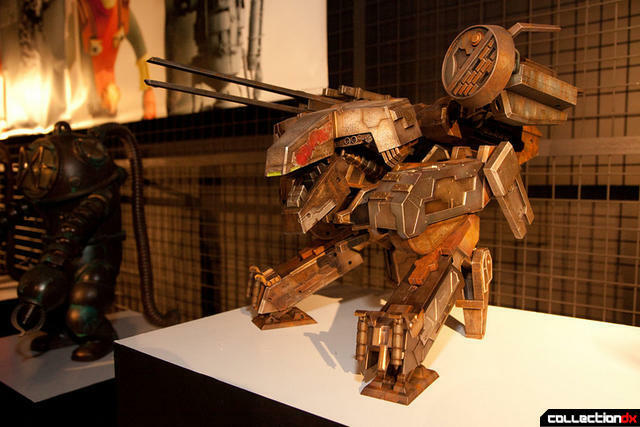 ThreeA announced a partnership with Kojima Productions and shortly after showed pictures of a Metal Gear REX prototype at a ThreeA event. Years went by and there was not a word of news regarding the release of the figure. 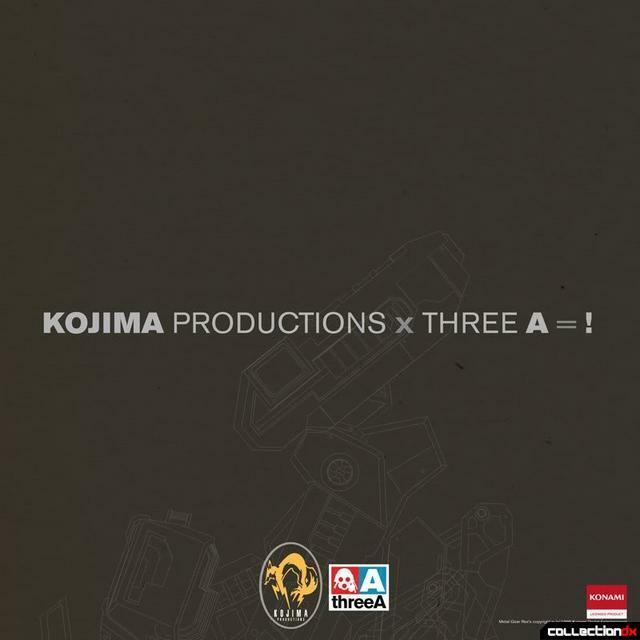 Had we just been teased only to have it never be released? 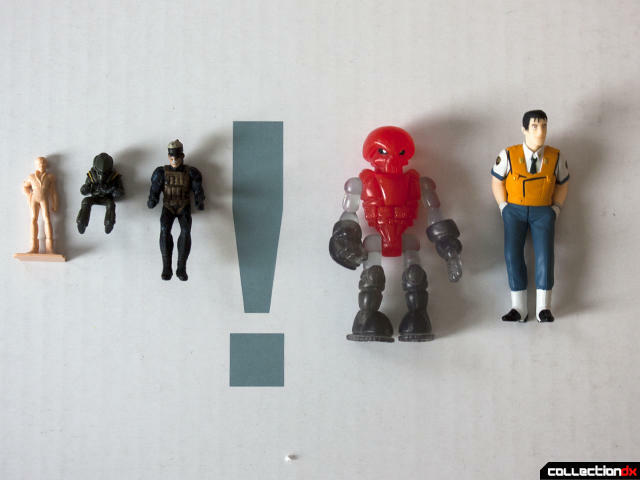 After years of silence ThreeA finally sent out an e-mail on March 1st 2012 (See it here) which stated that the figure would be available for pre-order the very next day and would ship in August 2012. 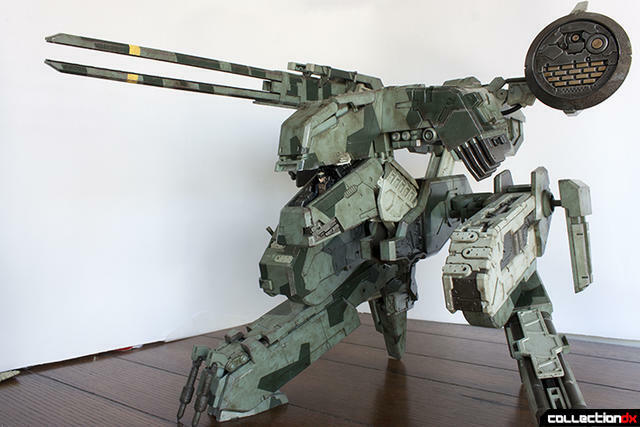 It actually took until January 2013 for most people to get their hands of Metal Gear REX, but it was most certainly worth the wait. The figure comes in a thick cardboard shipping box. Size and weight can be seen on the box. 55.5 x 47.0 x 53.5cm (22 x 22.5 x 21 in) and 8.4kg (18.5lbs). Yes, this thing is huge. Inside is another box of thick high quality cardboard decorated with great artwork. The front of the box has a large Yoji Shinkawa watercolor. 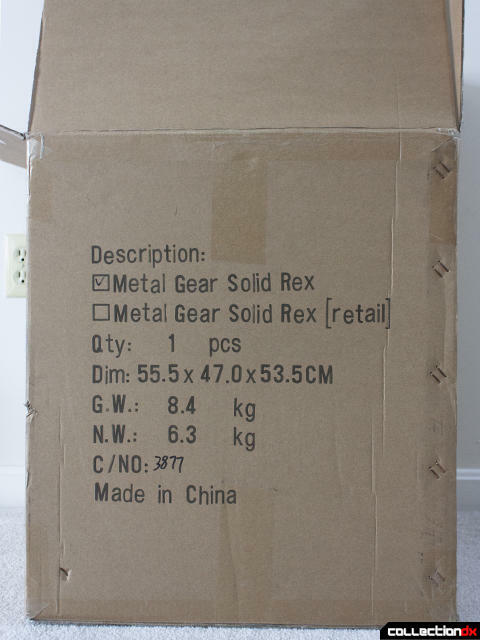 The rest of the box has some information about Metal Gear REX printed on it along with some other information. The bottom of the box says that three AG1 coin batteries are required but this is actually incorrect. 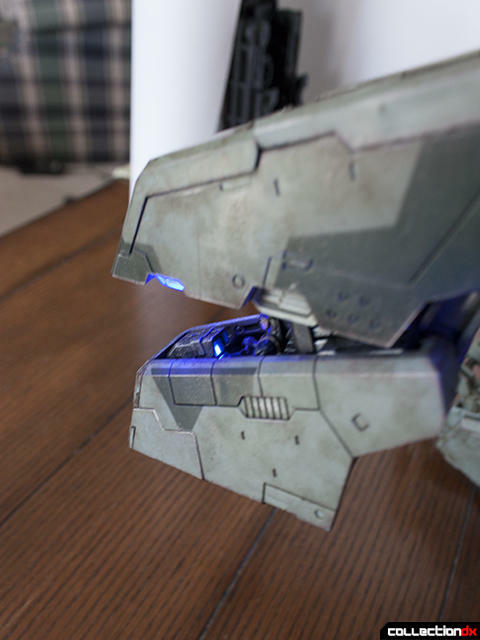 The figure actually takes a total of six AAA batteries which I greatly prefer due to availability and price. 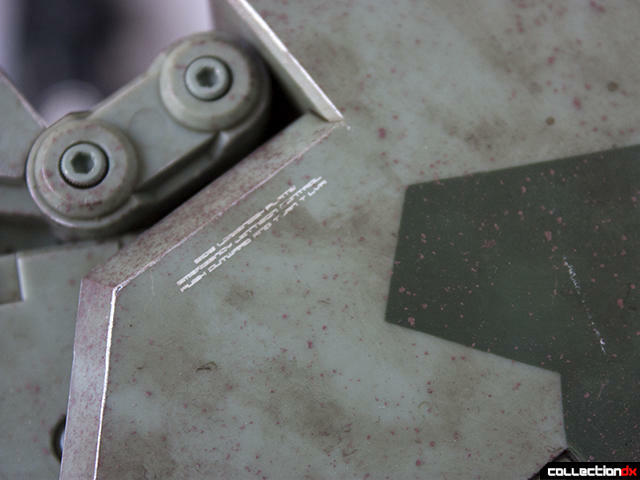 Under the lid of the box you will find a ThreeA catalog, instruction booklet, poster and another sheet of paper with instructions on moving REX's hip joints. 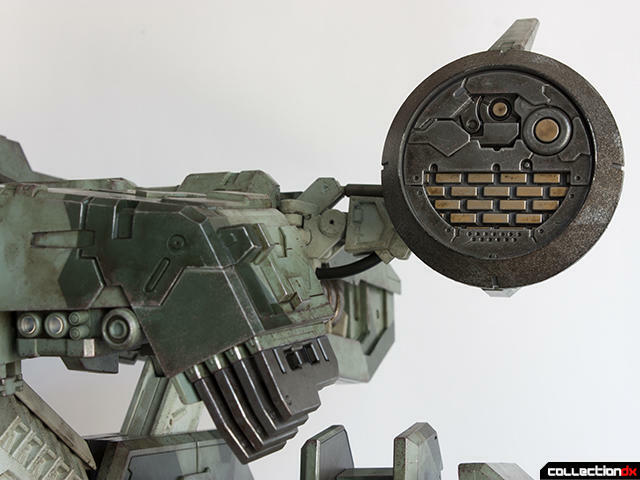 Also under the cover are the antenna for the radome, smoke launchers for the knees, joint moving tool, and the Old Snake figure (if ordered direct from ThreeA). The railgun is also here and fills the box from corner to corner. REX in entombed in a giant block of Styrofoam and takes some effort to remove from the package. 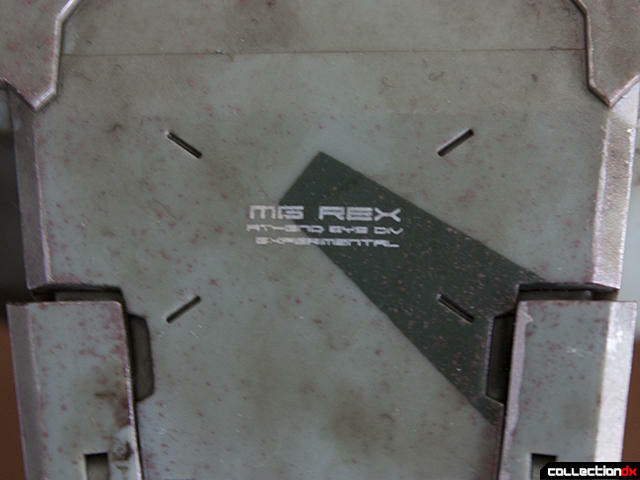 When you take REX out of the box the railgun, radome antenna, and smoke launchers are easily attached. Some of the missile covers come off in the package but are easily reattached. 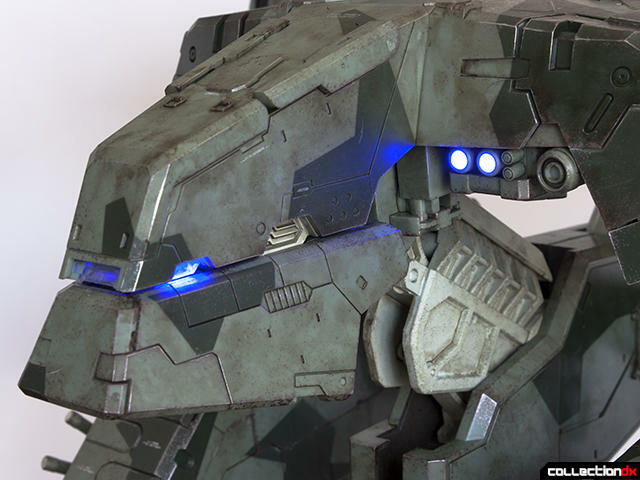 REX includes two light up features, each powered by three AAA batteries which are not included with the figure. Both battery boxes are well concealed and not noticeable on the figure. 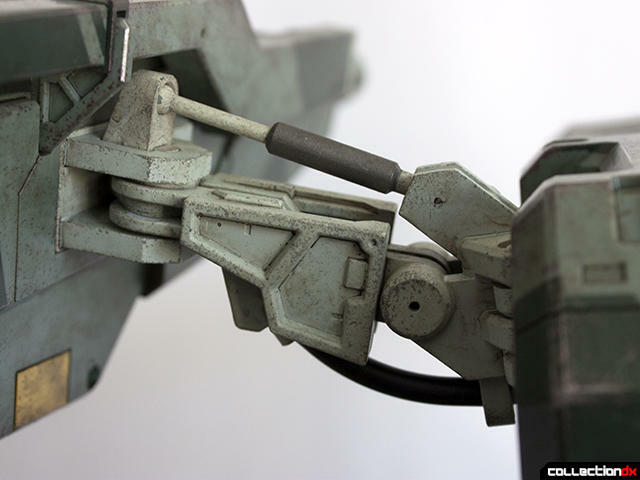 The lights in the head are operated by a small switch underneath the head. The lights are very bright blue and look great. The instrument panel also features a light. 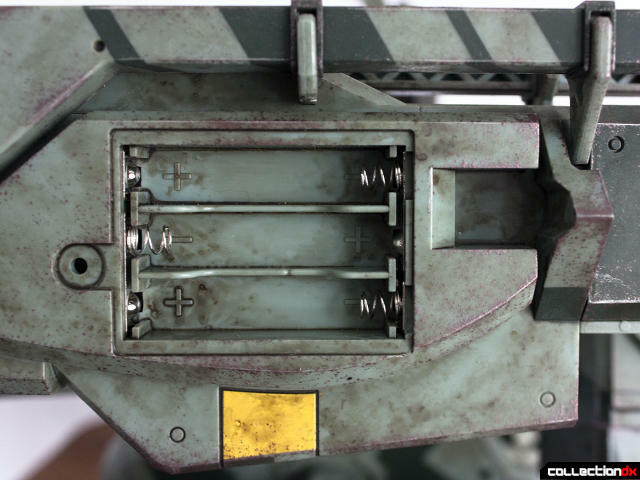 There is a concealed switch on the bottom of the railgun to switch it on and off. 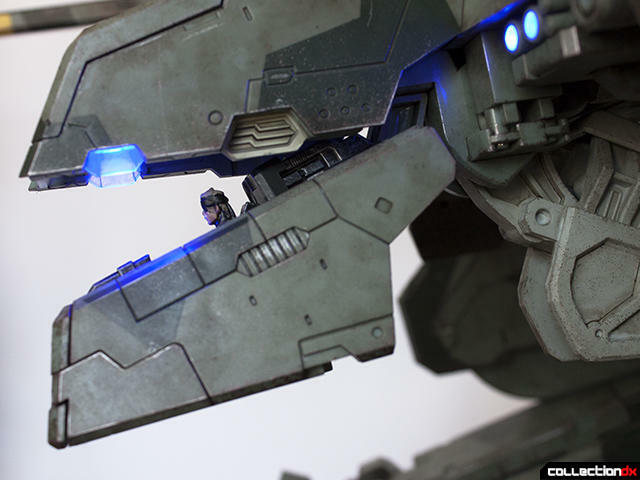 A small concealed button on the top of the railgun activates the light effect. 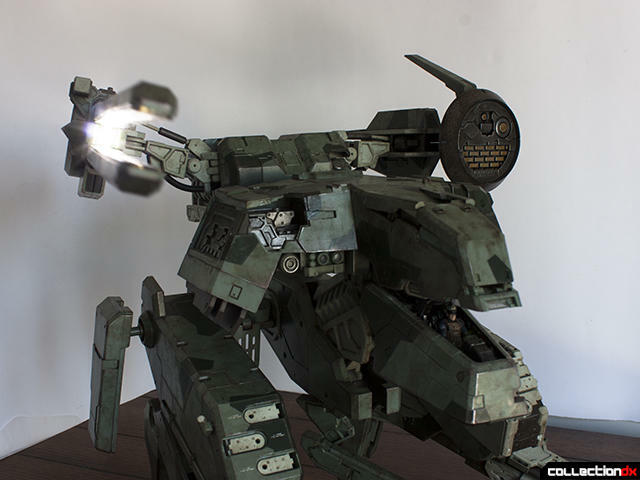 The railgun features a series of white LEDs on the top and bottom and a single LED at the base of the gun. The LEDs are all very bright and the effect is very cool. There is no sound effect to go along with it. 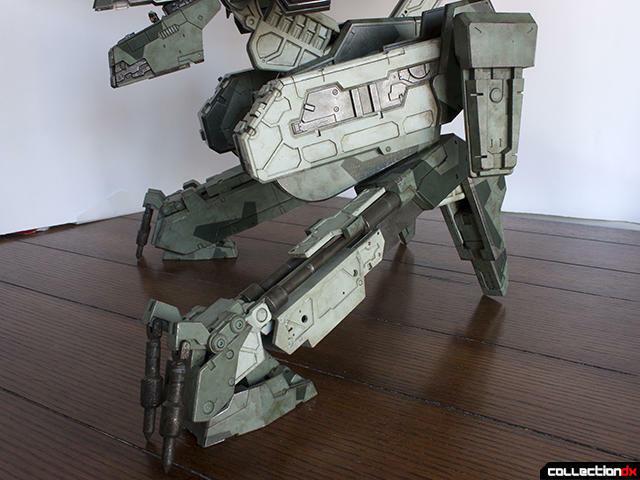 The design of REX is closer to its appearance in MGS4. It is amazingly accurate but there have been some artistic freedoms taken. Most notably to me there is a second fin on the radome that is not present. The paint on the figure is amazing. 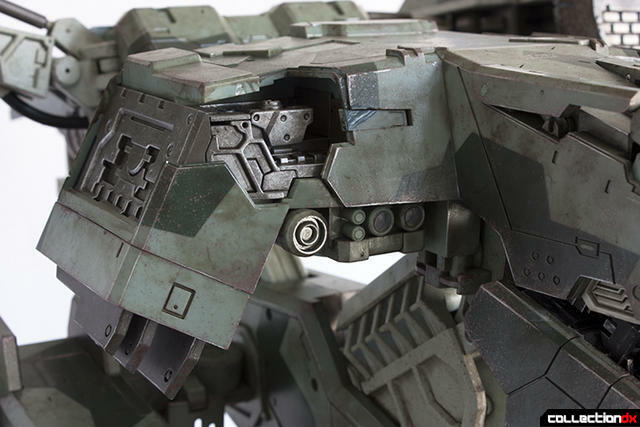 The figure is incredibly painted and weathered and every surface is painstakingly detailed. The figure also features abundant printing which is crisp and clear. The figure is very well articulated and the joints are all strong with one exception. 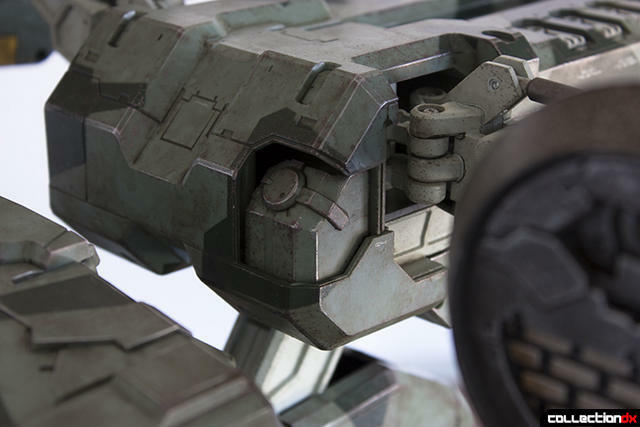 At first the joint for the railgun does not appear to be strong enough to hold the railgun up. If you press very hard you can get the railgun to lock in its upward position. The real problem here is that the inner piston is too long to slide far enough into the outer part. 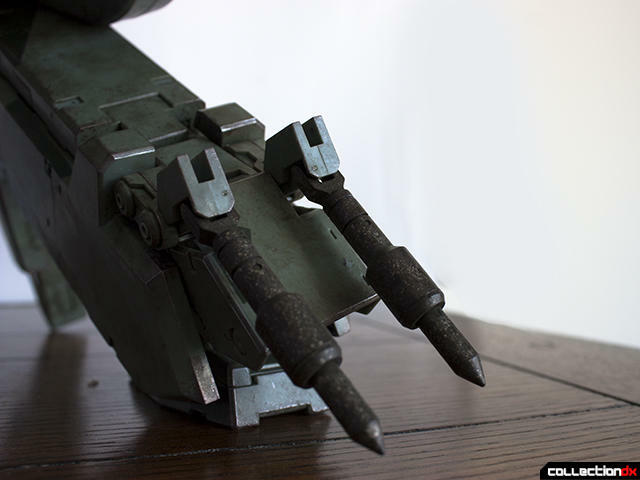 Removing and slightly shortening this part solves the problem, although the railgun still isn't able to hold itself in the level position. 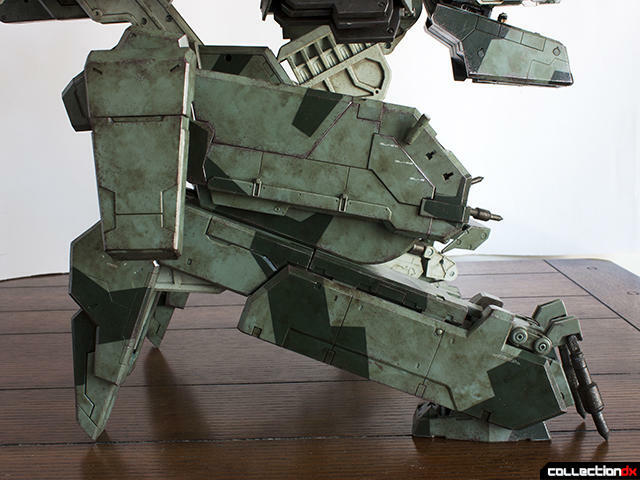 The toes and heels are quite posable, allowing REX to get into a lot of stable poses. The toes are are very well articulated and can contact the ground flat in nearly any pose. 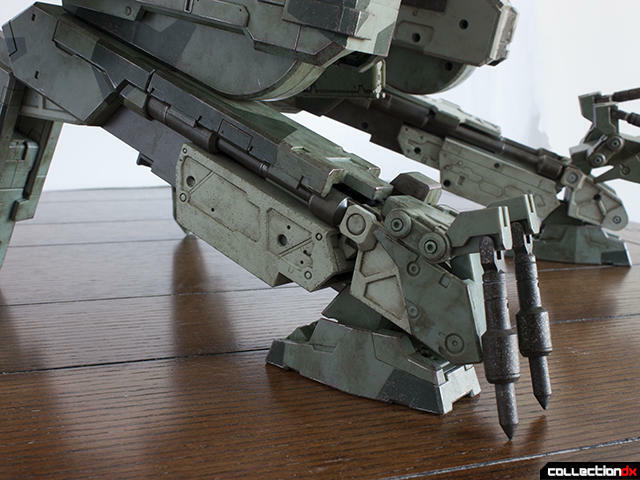 The heels are ratcheted and strong enough to hold in position for most poses. The spikes on the foot and armor on the end of the foot are also articulated. In addition each of the spikes is spring loaded. The hips are strong and an included tool helps with moving them. 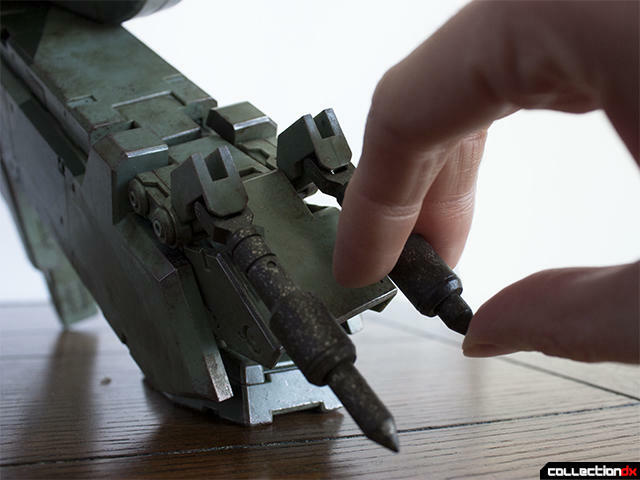 A series of joints allows for good articulation. The knee rotates and can also be collapsed. 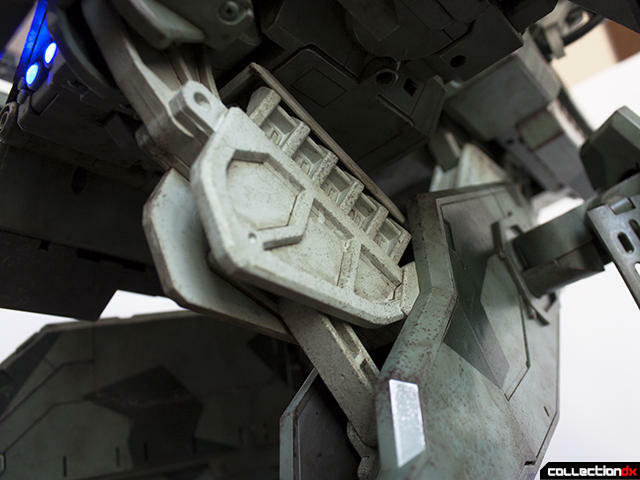 The hip armor is on a ball joint. 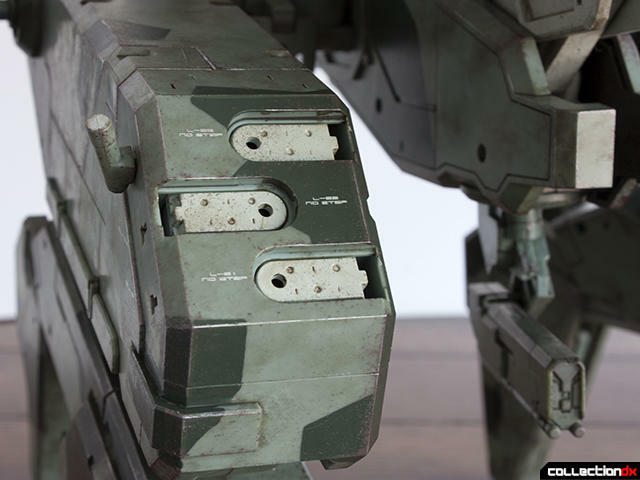 Both the railgun and radome feature similar joints. There is no joint to change elevation and both are locked parallel to the back section. The neck has a smooth joint where it meets the central body and a detented joint at the base of the head. It cannot look from left to right. 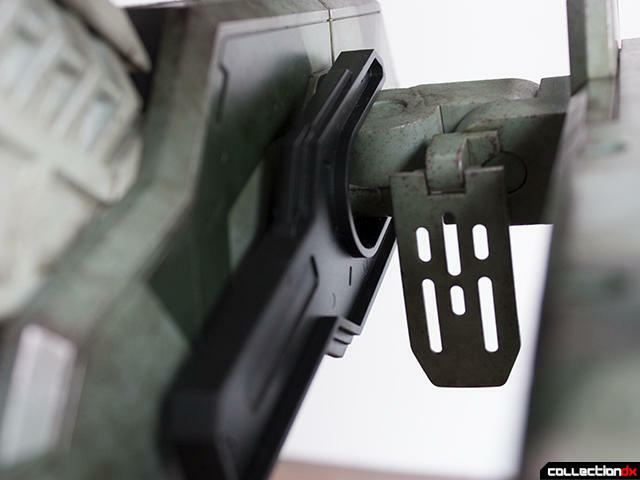 The rear section rotates around the hip and is detented. There is also a sliding joint to move this section forwards and back but it is quite difficult to move. The cockpit can be opened and a detented joint holds it in a few positions. The inside is lighted and well detailed. The paint and weathering are just as good as on the rest of the figure. 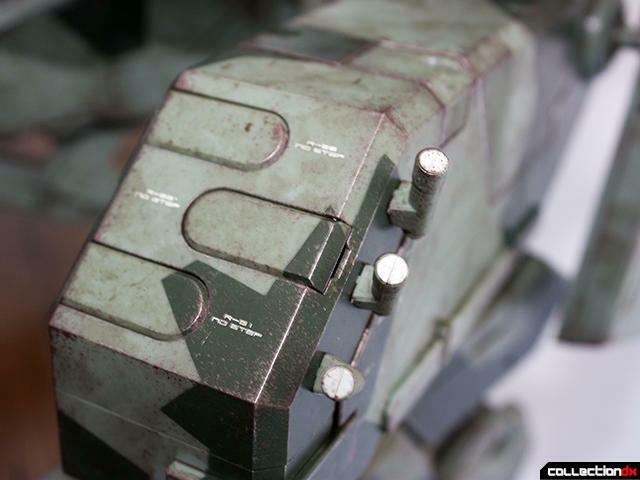 The included Snake figure (Bambaland exclusive only) can be placed into the cockpit. His legs are a tight fit and the figure can be difficult to get in and out. 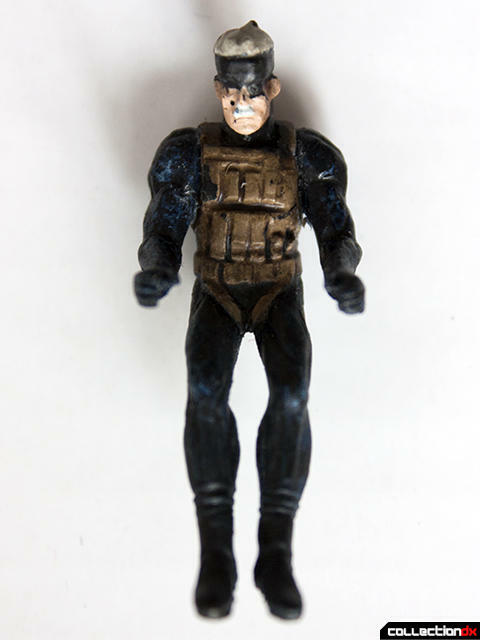 The sculpt and paint of Snake is okay but not great. if you look closely you can see areas of chipped paint/poor coverage. 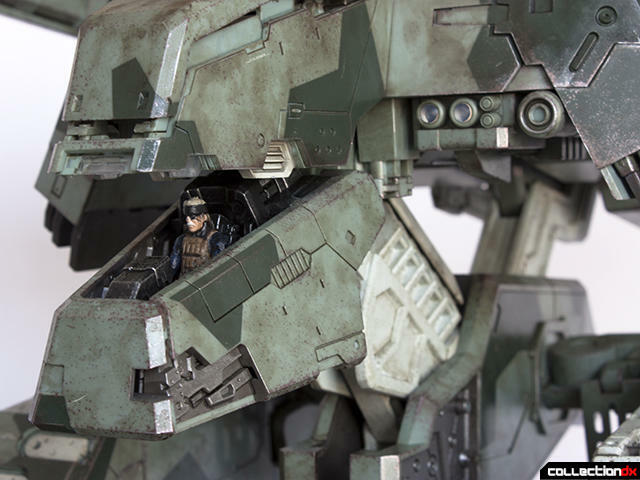 This figure is supposedly 1/48 scale but if you look at Snake next to some other 1/48 figures you can see that he is about twice the size. You can see that he is somewhere between the Yamato 1/48 pilot and Goto who is 1/24 scale. A cool feature about this figure is that much of the armor can be removed. Technically the railgun is supposed to be removed as well but I did not do this. The manual walks through all the parts that can be removed and there are a lot of them. Most of them come off pretty easily once you understand which way they come off. 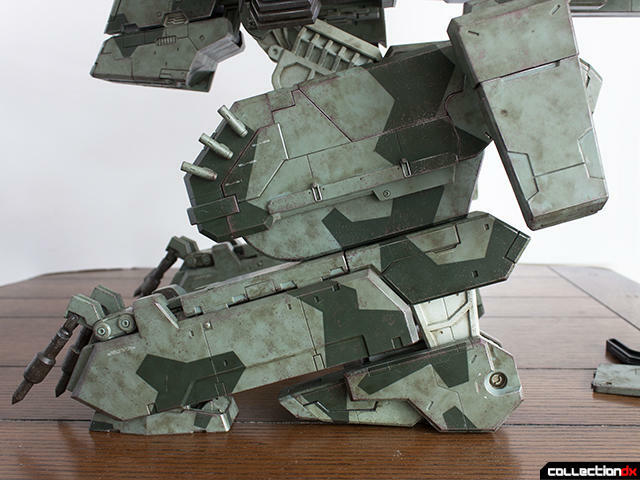 The detail is concentrated on REX's left side and most of the parts do not have an equivalent part on the opposite side of the body. The exception is on the lower legs. The armor can be removed from both sides and both legs can be extended. The amount of extension is about an inch. Here you can see the closer leg in its collapsed position and the back leg extended. 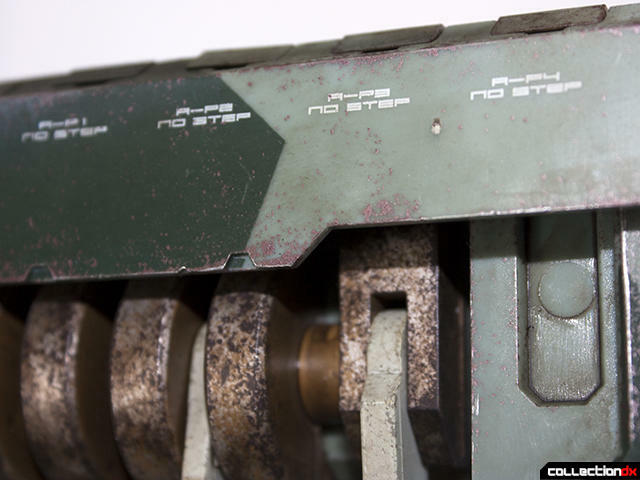 There is excellent detail underneath of all the panels and once again the paint and weathering is amazing. Overall yes this is a very expensive figure that might be out of reach for a lot of collectors. 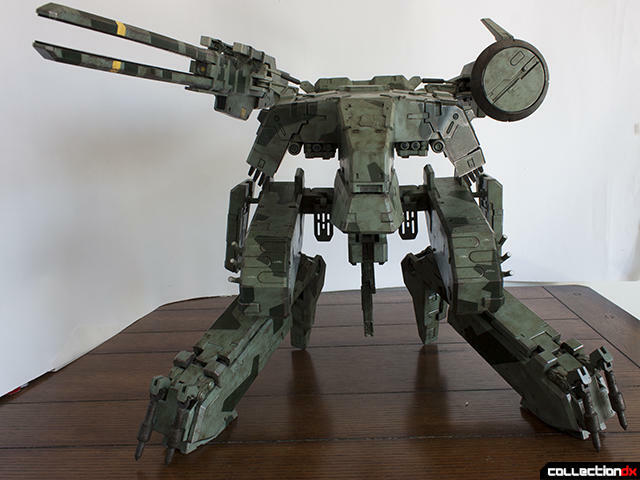 For a die-hard Metal Gear Solid fan I think that is is well worth the price of admission. 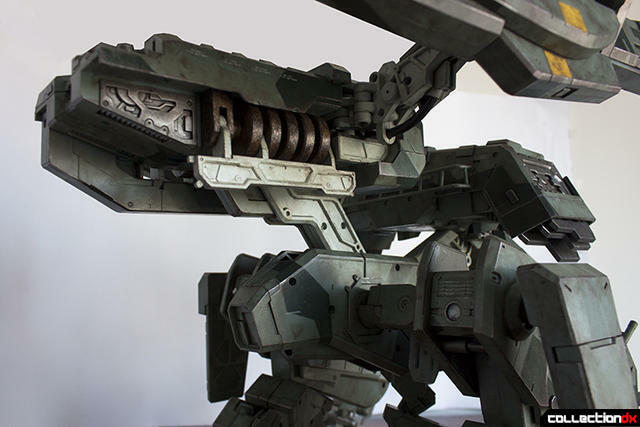 The figure is huge, well articulated, and exceptionally detailed. 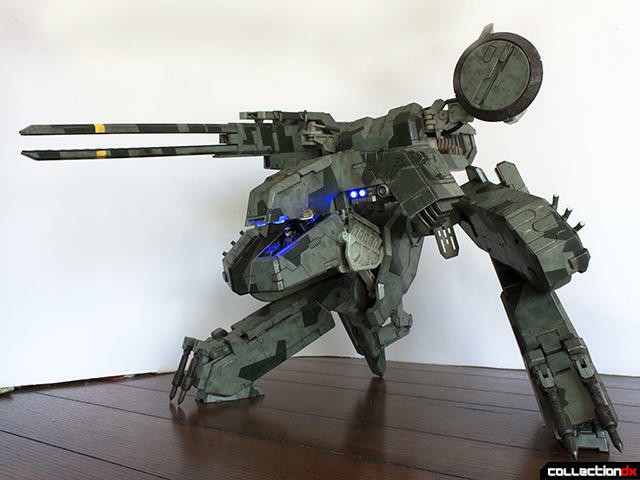 It's the Metal Gear REX I always wanted and it only took fifteen years to get it. If you want to get one at this time you're limited to the secondary market and slightly inflated prices. 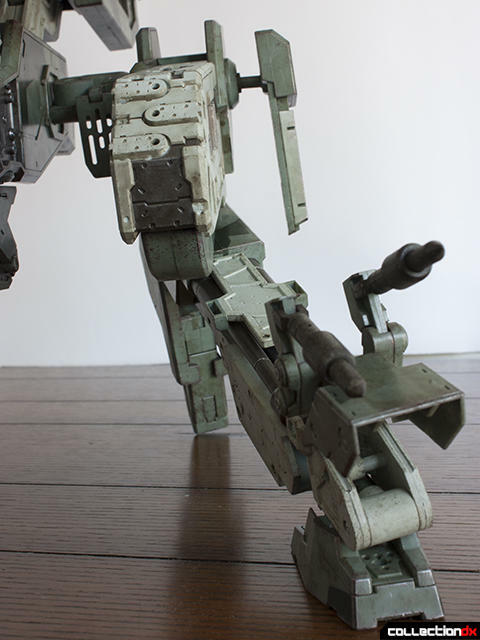 I don't know enough about ThreeA to be able to say if this figure will be re-issued. If you want one you may want to pick it up now before it becomes difficult to find. 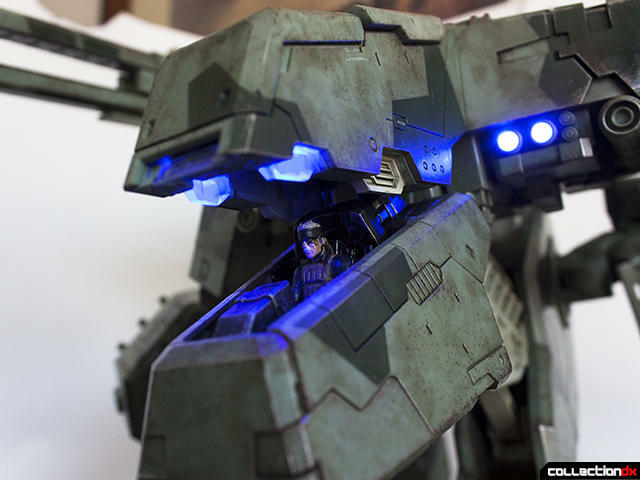 Real cool looking toy! I too think 3A has screwed up the printed scale. A 6 foot tall man in 1/48 scale would be 1.5 inches tall standing upright. 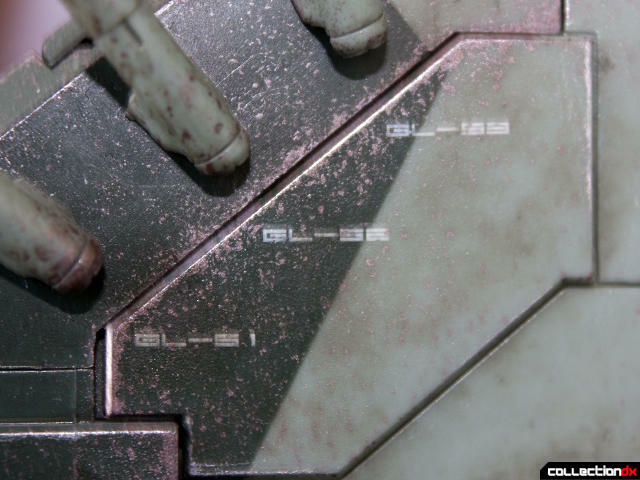 To me that Snake figure looks to be about 1/35 to 1/32 scale (a 6 foot man would between 2.06" to 2.25" in those scales). Question though. 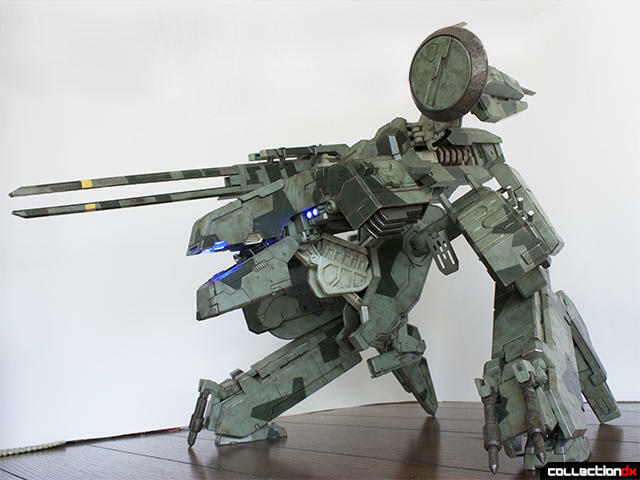 How long is the railgun? 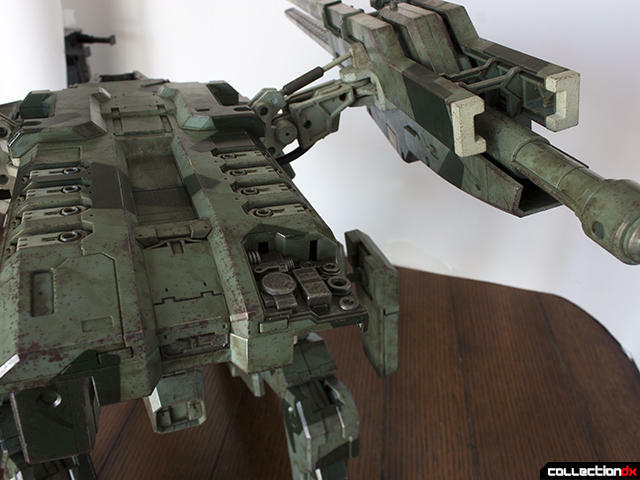 I thought that perhaps the inside of the cockpit was off in scale, But the railgun does measure about 23 inches. So perhaps the entire figure is closer 1/32. I was gonna freak out when I saw you already had this, but then I saw you got it direct. I feel like Sideshow is going to be the last retailer on the planet to get this and ship it out (March is the current window, BTW). 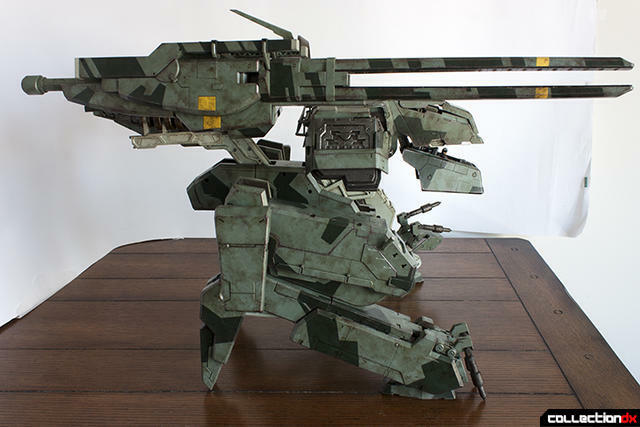 3A debuted their Ray prototype this year, and even if it takes another 4 years to reach the market, I'll be waiting to sign up as soon as it does. I'm not sure if you'll be able to help me out here but i recently managed to get a hold of these (In japan while i was on holiday of all places...) and i for the life of me can not get the battery cover underneath the head off at all. How is the cover supposed to come off? 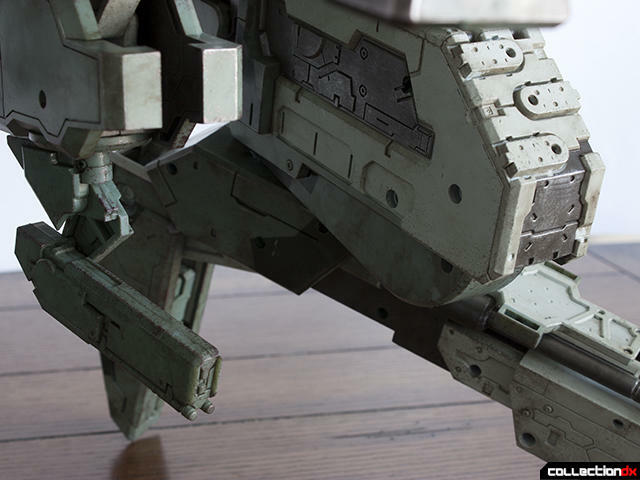 The manual is kinda vague (Like everything else, for example: how to actually move the joints). It's like the one thing i really want to get done (get all the lights up and running). If you can help me out (Like post a youtube video of how that thing comes off, which i've not found anywhere), i would so damn grateful. Maybe this is a really dumb question, but you removed the screw that holds it in place, right? Yes this cover does have a screw that has to be removed before it will come off. It is a little tight but it hinges away from the screw and comes off. Yes I did remove the screw.